A coach with a wealth of experience at the community college level is the new assistant women’s basketball coach at Kansas City Kansas Community College. Shaun Burki, 34, began his duties as assistant to Valerie Stambersky on Monday. While an assistant at Wabash Valley Community College in Mt. Carmel, Ill., Burki recruited the No. 1 community college player in the nation. 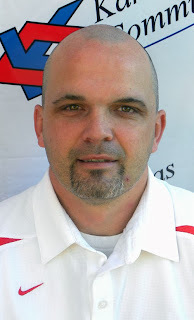 Burki first got into coaching while a student at Northeast Oklahoma A&M in Miami, spent a year at Oklahoma State and began his coaching career working with two coaching legends, Cletus Green and Bob Sneller, at Crowder Community College in Missouri. After four years at Crowder, he was woman’s assistant at Iowa Western in Council Bluffs, Southeastern Community College in Keokuk, Iowa, and Wabash Valley. A 1997 graduate of Miami (Okla.) High School, Burki played football, basketball and baseball at nearby Quapaw before transferring to Miami his final semester to play baseball at a higher level. Burki succeeds eight-year assistant Alicia Roth who is expecting her fourth child this month but will continue to assist in the program.